Action from Peterborough Sports' 4-1 home defeat by Carlton (stripes). Photo: James Richardson. Sports dropped into the bottom four after a demoralising 4-1 home defeat by Carlton on Tuesday night (October 10), just days after losing 3-0 at Basford in the club’s first FA Trophy tie. Action from Peterborough Sports heavy home defeat at the hands of Carlton. Photo: James Richardson. They’ve won just one of their last eight Division One One South matches ahead of a key home match with next-to-bottom Romulus at PSL tomorrow (October 17, 3pm). Only one team is relegated, but Cooper, who has overseen successive promotions for a club now playing at step 4 level for the first time in their history, is far from complacent, especially as he’s busy trying to restructure Sports behind the scenes in an attempt to make them an Evo Stik force. “Only one team goes down, but there is not a standout bad side in the division,” Cooper said. “Someone has to go down and we play the bottom two in the next two games. Sports follow the game against Romulus with a trip to bottom club Gresley (October 21). In between they have a mouthwatering League Cup tie at local rivals Stamford AFC on Tuesday (October 21). The Daniels are in decent form. 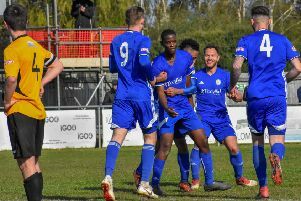 They are unbeaten at home this season and moved into the first round proper of the Trophy with a 3-0 win against Loughborough Dynamo last weekend. Former Posh striker Lee Clarke has signed for Stamford who host Lincoln United tomorrow. He played for United Counties Division One table-toppers Blackstones in a 1-1 draw with Olney last weekend. Stones are at Raunds tomorrow. Big game in the Premier Division sees Deeping Rangers host unbeaten Newport Pagnell. Yaxley host Harborough, while Peterborough Northern Star’s young side travel to Wellingborough Town. Division One South: Peterborough Sports v Romulus, Spalding Utd v Sheffield FC, Stamford v Lincoln Utd. Premier Division: Deeping Rangers v Newport Pagnell Town, Rothwell Corinthians v Holbeach United, Wellingborough Town v Peterborough Northern Star, Wisbech Town v Northampton ON Chenecks, Yaxley v Harborough Town. Division One: Bourne Town v Thrapston Town, Long Buckby AFC v Pinchbeck United, Stewarts & Lloyds v Huntingdon Town, Raunds Town v Blackstones. Division One: March Town United v Halstead Town, Wisbech St Mary v Braintree Town Res.